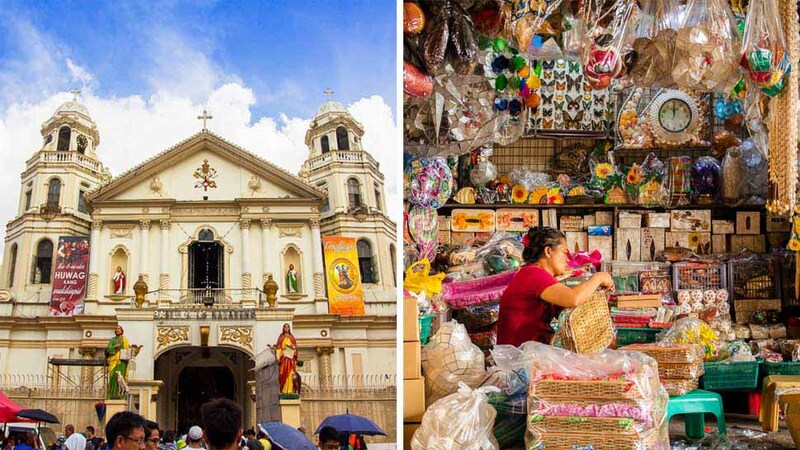 Ready to go on a Quiapo adventure? 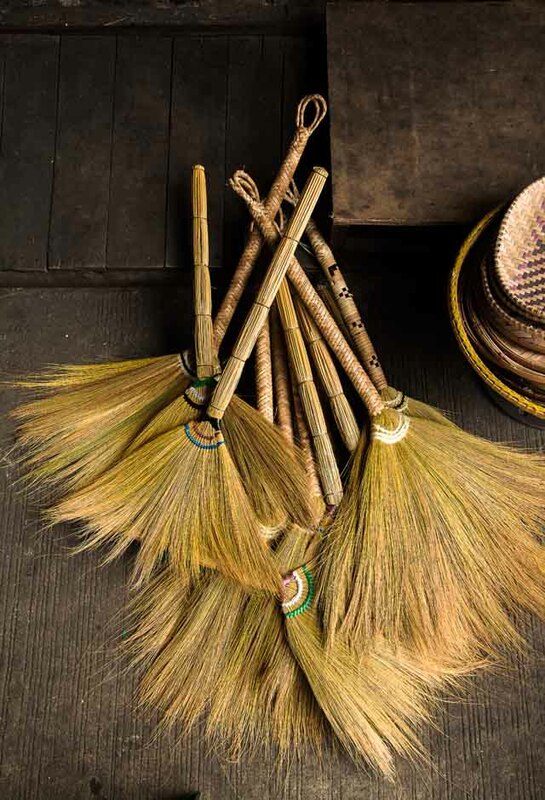 From Ilalim ng Tulay to Plaza Miranda, you are bound to spot a budget home find. Read on for our list of stores and buyers tips. 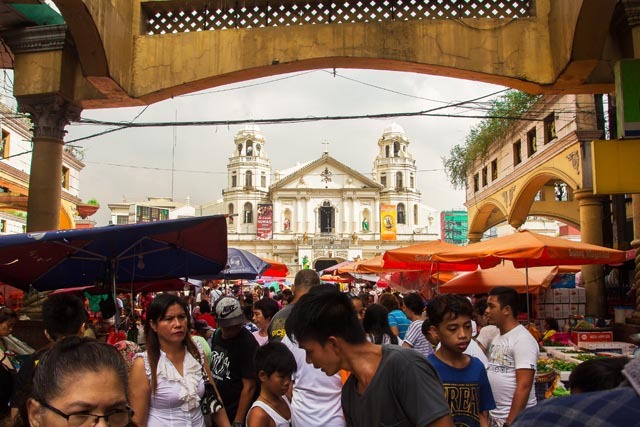 The Quiapo district in downtown Manila is one of those places that instantly give a flavor of Filipino culture. Whether you’re a balikbayan who hasn’t been here in a decade, or a local resident who doesn’t usually head to this side of the metro, you’ll surely find its sights fascinating. 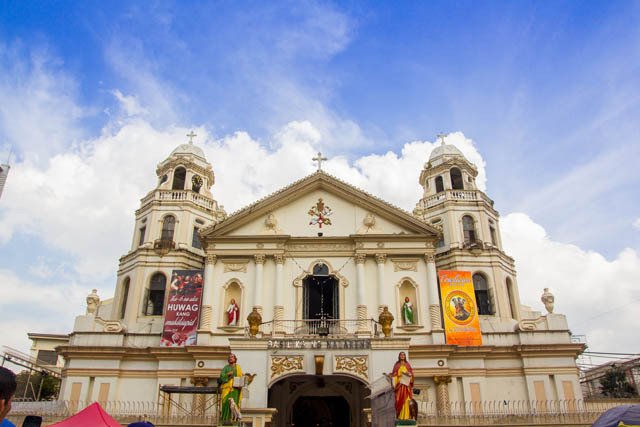 At Quiapo Church or the Minor Basilica of the Black Nazarene—a well-known landmark in Manila—devotees of the miraculous Black Nazarene rebulto come in droves every Friday to hear mass and pray the novena. Other devotees even feed the homeless who seek shelter inside the church during the wee hours of the morning. Plaza Miranda, which faces the church, is lined with vendors selling candles, garlands, religious figurines, and what have you. Manghuhula (fortune tellers) sit at a row of tables under umbrellas, waiting for the next person seeking for a tarot card reading. And oh, the commerce! 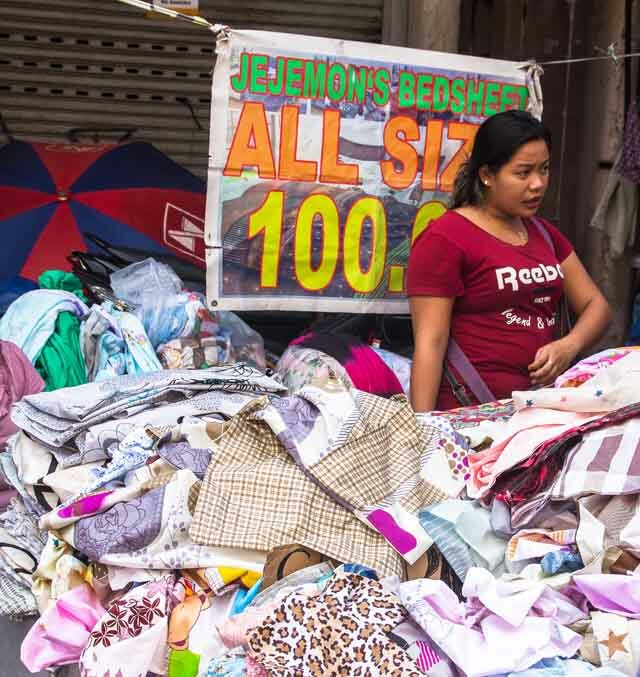 The streets of Quiapo are bustling with commercial activity, and we’re not just talking about the brick and mortar stores. 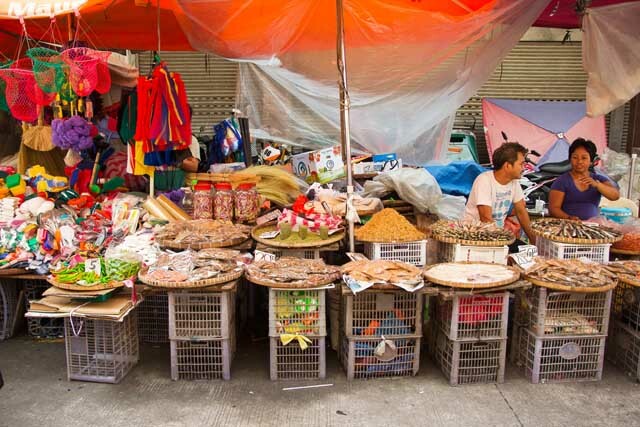 The makeshift stalls along the streets show the Pinoys’ incredible ability to make do with what they have: a perfect example are those bilaos placed on wooden shipping crates to hold anything and everything from vegetables to bed linen to drinking glasses to cleaning supplies. 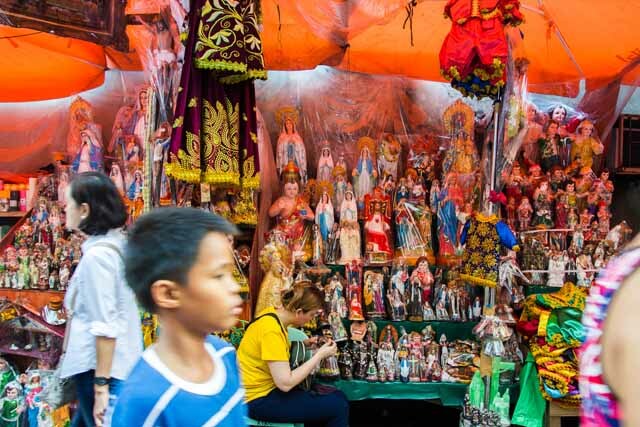 Does the prospect of going Christmas shopping (and sightseeing) in Quiapo excite you yet? You’ll surely make surprising discoveries on your own, but here’s a quick guide to get you started. 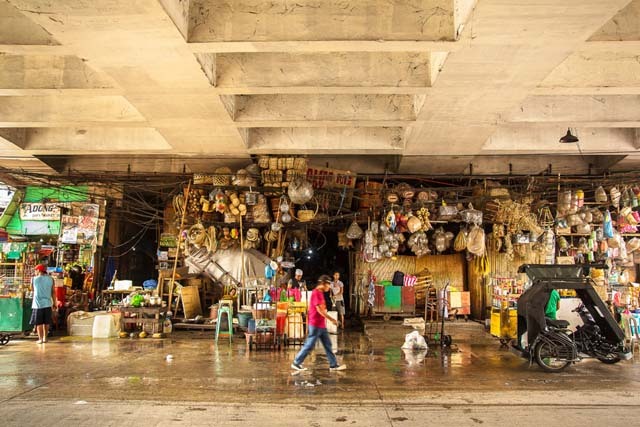 The stores under Quiapo Bridge (fondly referred to by shoppers as Ils de Tuls or Ilalim ng Tulay) are the go-to spots for tourists and balikbayans who want to bring home souvenirs like straw hats, coin purses, and those ubiquitous wooden back scratchers. Wooden salad bowls that are P250 (depending on size), and native placemat and coaster sets that go for P250 are great gift ideas. Find everything made from capiz shells here: placemat and coaster sets for P400, lamps for P3,000, jewelry boxes starting at P350, napkin rings at P120 per set of 6, alarm clocks at P250, chimes for P150, and a decorative round mirror at P7,000. 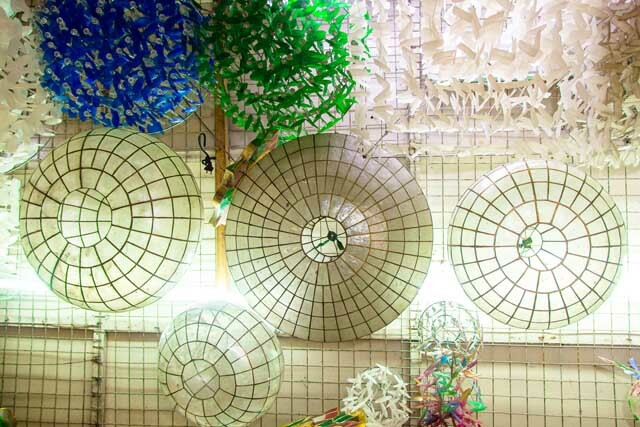 A capiz parol ranges from P400 to P10,000 depending on the design. An exquisite mother of pearl tissue box sells for P2,800. We chanced upon this vendor folding and packing Philippine flags, which they get several orders for. 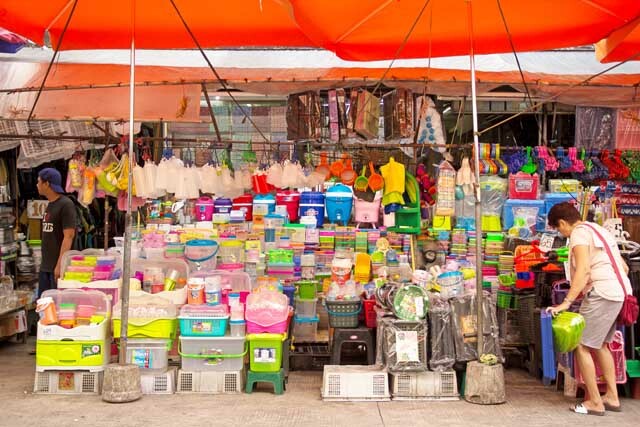 But the bulk of the merchandise sold at this stall is composed of gift packaging materials in various sizes: sinamay bags from P15 to P70 (or P80 for 10 pieces), and traditional woven bayong bags for P10 to P200. 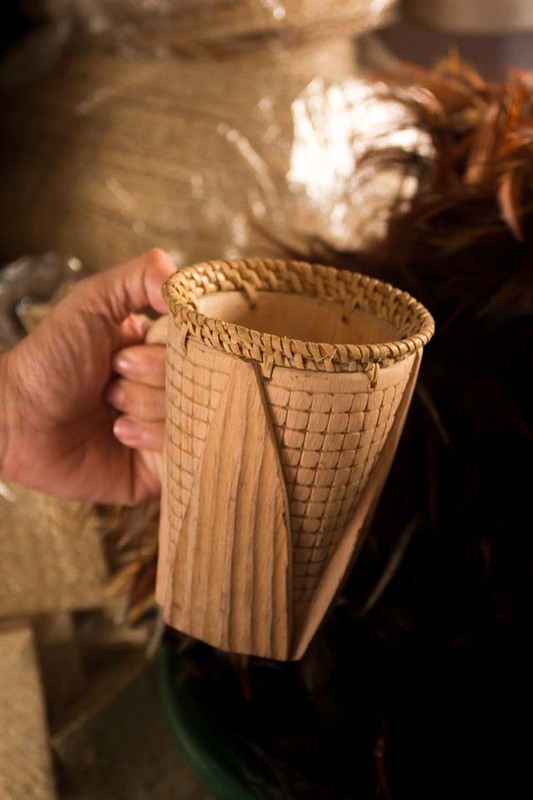 A quirky find is this wooden mug from Banaue, sold for P300, which you can use for drinking or a holder for knickknacks. 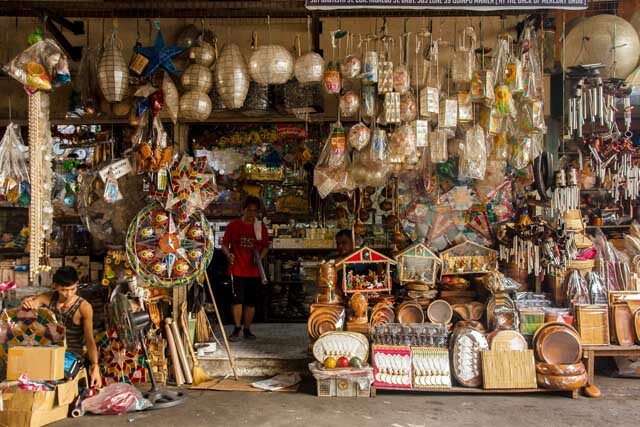 With a stall under the Quiapo bridge and another one in the building across the street, this store carries an extensive collection of carved wooden statues, capiz products, lanterns, bags, hats, abaca items, and more. 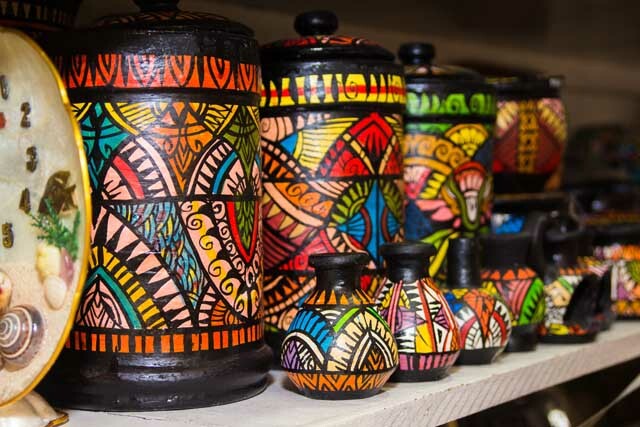 Look carefully and you’ll find unique items such as clay painted jars from Bulacan, from P80 to P700, and classic lutu-lutuan sets made from clay, sold at P550 each. 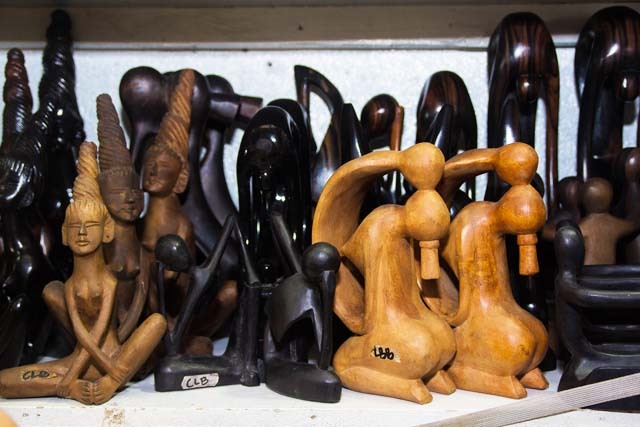 A wooden statue of a kissing couple, believed to be a fertility symbol, can be bought for P350. Baskets used for grocery gift sets are priced at P100 to P120. 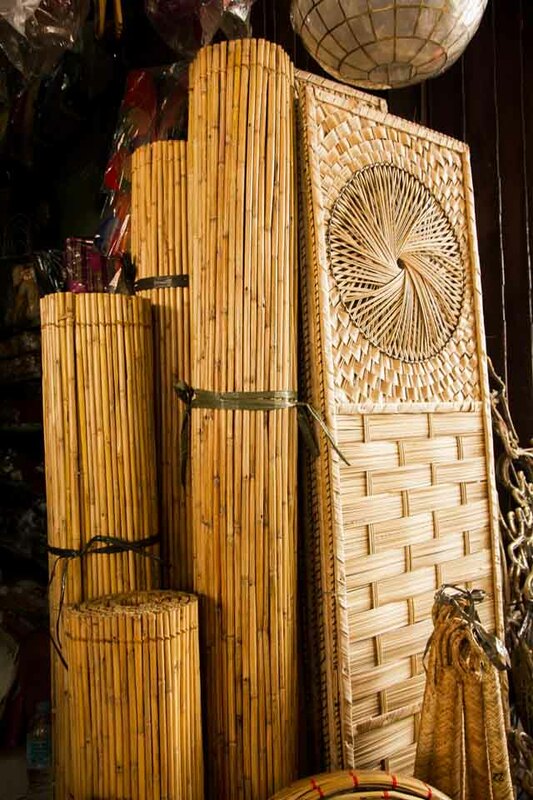 Here, a classic, retro-looking four-panel abaca divider goes for P1,200, while bamboo blinds are priced at P500 to P900, depending on the size. Baskets for utensils, which come with a fabric lining, go for P200, while colorful decorative frames are priced at P150. Holiday decorations such as parols made from native materials are sold for as low as P50 to P650 depending on the size and material used. Get a rope hammock for P250 to P450 and bring it to the beach, province, or wherever you’re headed to this Christmas. 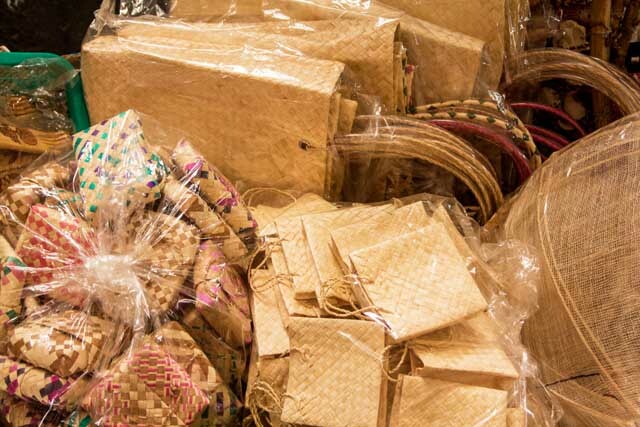 You can also score home essentials such as woven rugs for P50 to P65, and walis tambo for P180 to P120, as well as decorative abaca lamps for P150 to P2,800 (with lights), and bamboo sticks with faux leaves at P120 per set of 10. Tucked somewhere in the store is a wooden picnic table sold for P700. 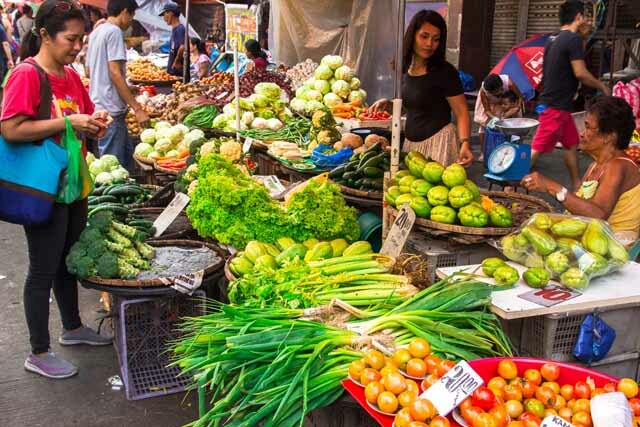 This street is lined with makeshift stalls under umbrellas, most of them selling a variety of food items, mostly vegetables, at affordable prices of P10 or P20 per tumpok (pile). Dig into a pile of cotton bed sheets, priced at P100 for any size. Buy a new stash of woven floor rugs for P25, cleaning rags at P10 for four pieces, and potholders at P10 apiece. Get your cleaning and laundry essentials at bargain prices: brushes for P20 to P35, scrubbing pads at P10, and clothespins at P10 to P15 per set. Go old school and score a kawali (aluminum frying pan) for P149 to P339, depending on size. 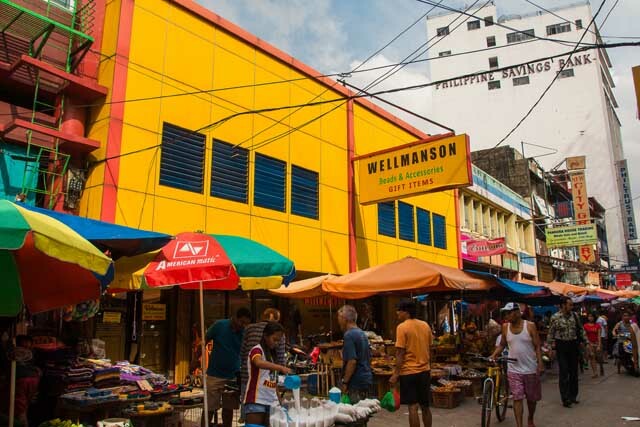 Wellmanson Beads & Accessories is a one-stop shop for ready-made accessories as well as raw materials such as plastic and glass beads, and tools for crafting your own costume jewelry creations. 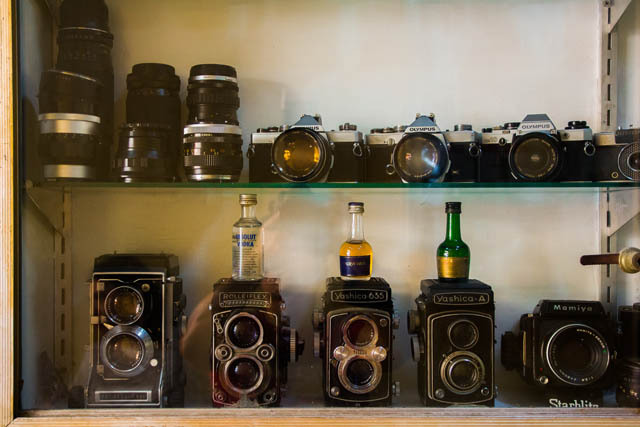 Photographers—both hobbyists and professionals—troop to this famous street to buy photography supplies and accessories, and to have their cameras and other equipment repaired. Some photography stores here now have more accessible branches in malls, but if you want a good deal, you should still come here. Take note of store hours as some are closed on Sundays. Amidst the rows of photography stores, we found a shop selling ceramic plates, bowls, glasses, and mason jars, from under P50 to P100 each. 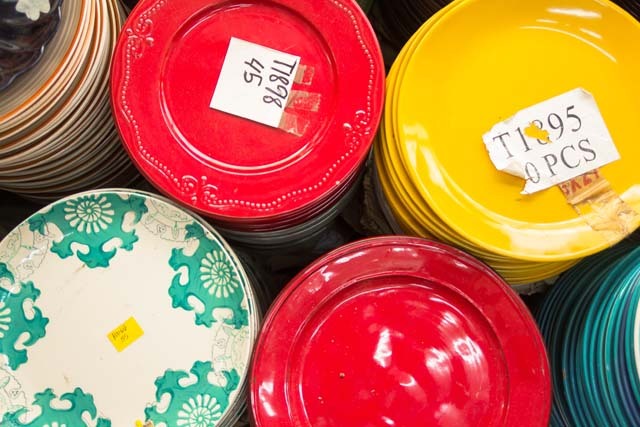 Prepare to spend a lot of time browsing through the piles of houseware sold here. Surrounded by Quezon Boulevard, Hidalgo Street, and Evangelista Street, this historic public square has been the site of many political gatherings (one of which ended in an unfortunate bombing). 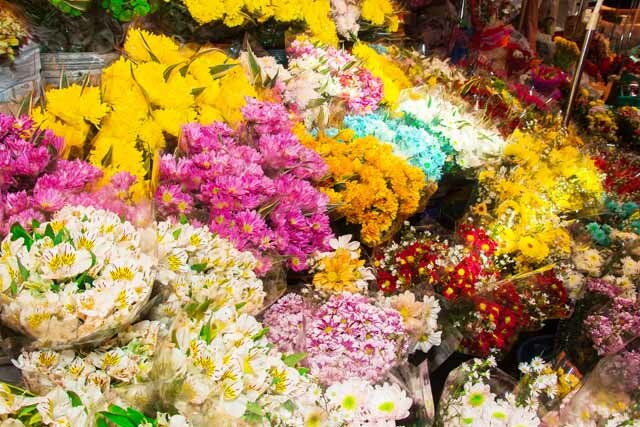 Churchgoers and other regular clients purchase flowers from this stall at P200 per dozen of Malaysian mums. 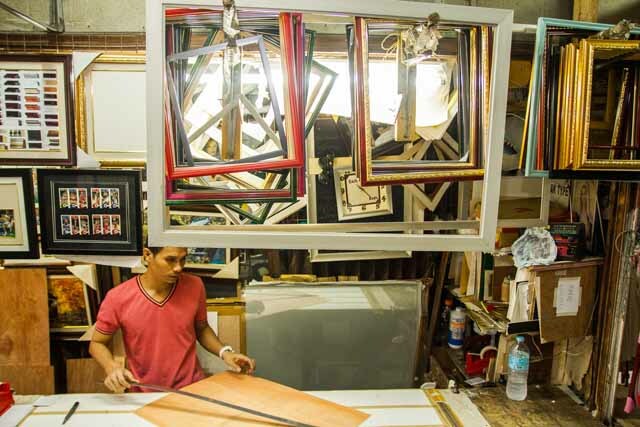 We chanced upon Ranil Frame at Illusyon Arcade, where you can have photos framed for P70 to P1,000 depending on size, or have photos placed in photo albums (photos supplied by customers) for P400 to P1,200 depending on photo size and number of album pages (plus a P200 service charge). Did we mention you can have all this done while you wait? Minimum waiting time is 30 minutes! 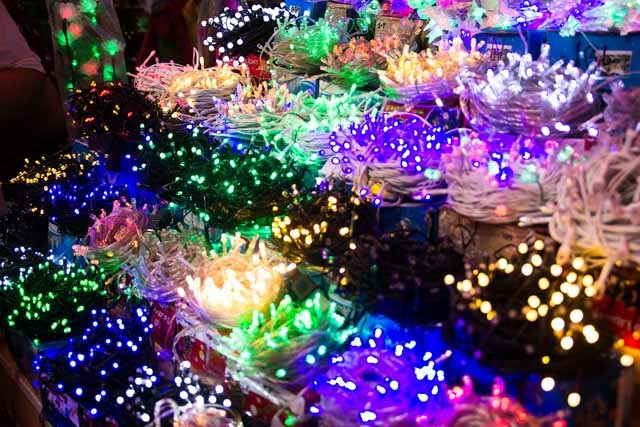 This street is literally lit up for the Christmas season, with various gift items and décor stretching all the way to the corner of Rizal Avenue, also known as Avenida Rizal. Avenida Rizal, by the way, is also lined with electronic stores, should you want to shop for home and kitchen appliances. 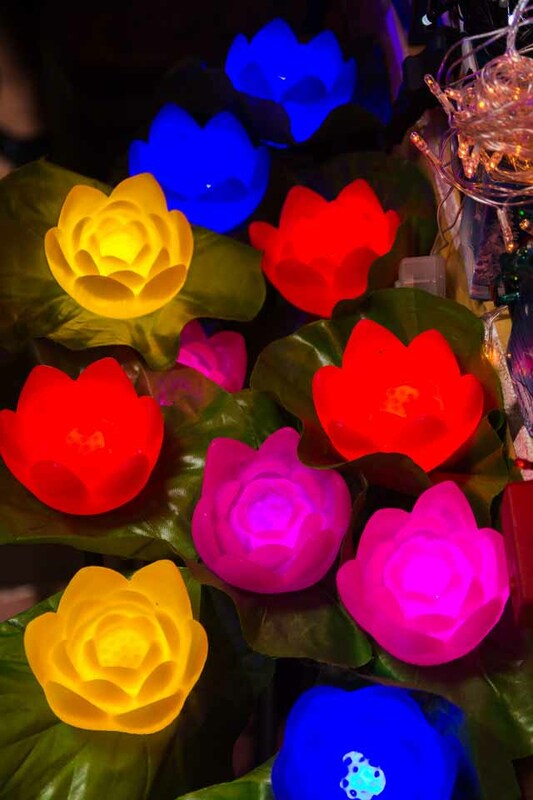 Ordinary Christmas lights range from P120 to P350, but you may also want to go for a set of stemmed floral lights (12 pieces), sold at P1,500. Christmas trees start at P350, which you can decorate with poinsettia flowers, priced at P10 apiece. Hanging Merry Christmas signs are sold for P150, while Santa décor start from P250 to P350. 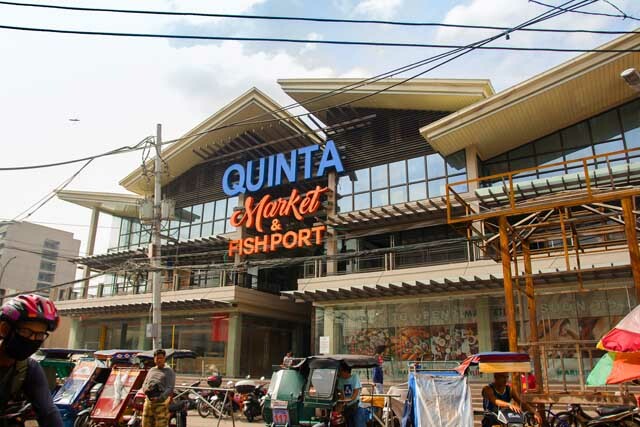 The old Quinta market has been resurrected into a modernized structure, which has an air-conditioned restroom, a food court, a 100-vehicle car park facility, and segregated wet and dry sections. Skip the crowds and the traffic. Don’t go on a Friday, which is the day all the Black Nazarene devotees come to Quiapo church for the novena. Sundays draw crowds, too, but you can come early and leave by lunchtime. 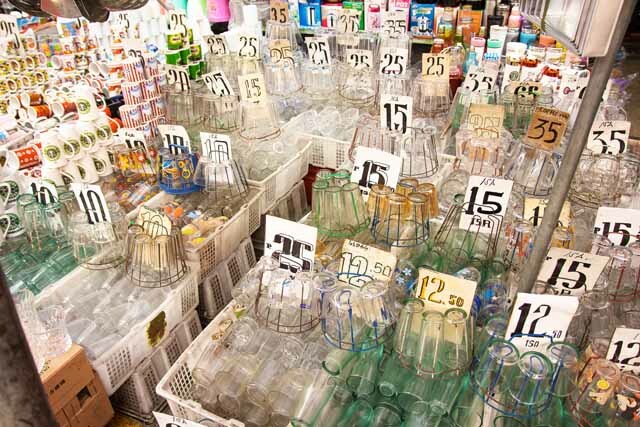 Ask vendors for calling cards if there is something you intend to come back for or buy in bulk. Bring your own eco bags. If you intend to buy breakables like dinnerware or religious statues, bring a sturdy, cushioned bag or newspapers. Take public transportation so you don’t have to worry about finding parking space in this difficult area. Since Quiapo is a place best toured on foot, wear comfortable walking shoes, preferably sneakers. Bring small peso bills for faster transactions.